Beyond being the guinea pig for an untested system, make sure to do some competitive due diligence before putting all of your chips on the table. It looked interesting-ish, but the achilles heel is the mechanical fastening of walls to bottom channel. Rust, in hidden fasteners, is not your friend. We had a client price out the Giga system for a house on St. John, and even at STJ concrete prices, the plaster and concrete **in place** would cost less than the Giga system delivered to the site. Back to the good old tested cast-in-place concrete. Actually, rust is a non issue as the entire assembly is sealed by coatings, hence, not exposed to water or air. In addition, unlike Portland-based coatings, waterproof GigaCrete coatings are unaffected by salt spray and don't crack. Extensively tested. Lest we forget, these coatings are also ideal over CMU. Indeed, concrete block walls require no mortar between the blocks if the surface of the stacked blocks is coated with GigaCrete on both sides. No rebar required, either. That's how strong these coatings are. There's nothing like them on the market today. There are plans for a factory in the USVI. That should bring the costs down, not to mention creating job opportunities and export distribution. Is a gigcrete structure better insulated from heat than a concrete structure? Walls R-22 with 6-inch EPS panels coated. Roof R-46. These are minimum values as thicker EPS panels can be deployed. There are interior access panels for electrical and plumbing. Parenthetically, ICF has become an increasingly popular method of construction. This ICF house (recently sold for $2.2M) is in Marin County, California, and overlooks SF bay. It was built using GigaCrete coatings over ICF, inside and out, including faux stone facade. PlasterMax is world's only code approved interior coating to replace drywall over ICF, as PM is fire rated. Fragile drywall is of course notorious for mold issues. Gigacrete Stuccomax exterior stone and stucco walls"
These are pictures of the first GigaCrete GigaHouse erected in USVI by GC subsidiary GigaCrete Caribbean LLC, St. Thomas. Opportunities for local job creation and export as this technology spreads and planned USVI factory gets up and running, not to mention availability of affordable, high quality, energy-efficient housing that resists hurricanes (200 mph), water, salt, insects, vermin, rot, mold and mildew. ps. There was a full page advertisement about GigaCrete technology on page 17 of Island Trader (August 20, 2015). Calls it "the global game changer in the building industry." A photograph album on Facebook features a sequence of ca. 30 full size pictures showng, step by step, the assembly and finishing (with high psi non-Portland mineral-based PlasterMax & StuccoMax) of a GigaHouse--GigaCrete Caribbean HQ at entrance to Humane Society. Starting with a thick poured concrete slab and utilities, the simplicity of the construction is the beauty of it. Note thickness of insulating EPS panels and the clever patented design eliminating thermal bridging. Note also threaded hurricane anchors poking at intervals through the track. These anchors, embedded deeply into the slab, will securely bolt the steel roof frame (and the house itself) to the concrete base by means of steel connector rods. The album starts here. Clicking on "+27" in the first photo links to the sequential picture show. What's the cost per Sq. Ft.? "Concrete pads or slab foundations are preferred for fastest installations" reads the parent company website. In another place, it states, "Roof to foundation anchors are used to tie down the roof through mechanical steel connections to the foundation via all-thread, coupling nuts and expansion anchors set into the concrete slab or footings." Moving on up. None other than Forbes magazine ran a big piece on GigaCrete today. Forbes is the most widely read business magazine in the world beating Fortune Magazine both in print circulation and online viewers. There are 25.2 million unique readers of forbes dot com. Plaudits to GigaCrete Caribbean LLC (St. Thomas), licensed distributor of GigaCrete, Inc. products for Bermuda, the Caribbean, and South America. GCC built the first GigaHouse in USVI recently and plan to set up a local factory. Ahead of the curve, GCC arguably moves into position to bring needed jobs and export opportunities to USVI, not to mention fast-build, affordable, hurricane-proof housing. "A Storm Proof Bulletproof 'Concrete' with Few Competitors"
Talk about free advertising here on moving forum. This line from the Forbes article seems to sum it up for me, "...cost him roughly 15 percent more than a traditional cement-build". It's a stretch here to afford cast in place concrete construction, so why spend a 15% premium on top of that just for better insulation? Solid concrete has been proven to weather storms pretty well, and local crews are familiar with the methods, and it's time-tested, unlike giga. The claim that you could "eat" the product doesn't hold up for me either, I prefer food. Saving $600 a month on A/C costs doesn't make the math work - let's just say his house would cost $1 Million to build in concrete, so he spent an extra $150,000 [15%] to try out gigacrete. At $600 a month savings, it'll take 20 years to pay off the upcharge in electricity savings - whereas adding insulation to the typical concrete structure would be less expensive with a quicker payback. Could also spend $40k on solar panels and make out far better. Despite all of the hard selling, I'm not sold. Talk to me again once the costs are on par with wood frame and plywood siding. A million dollar house it ain't. 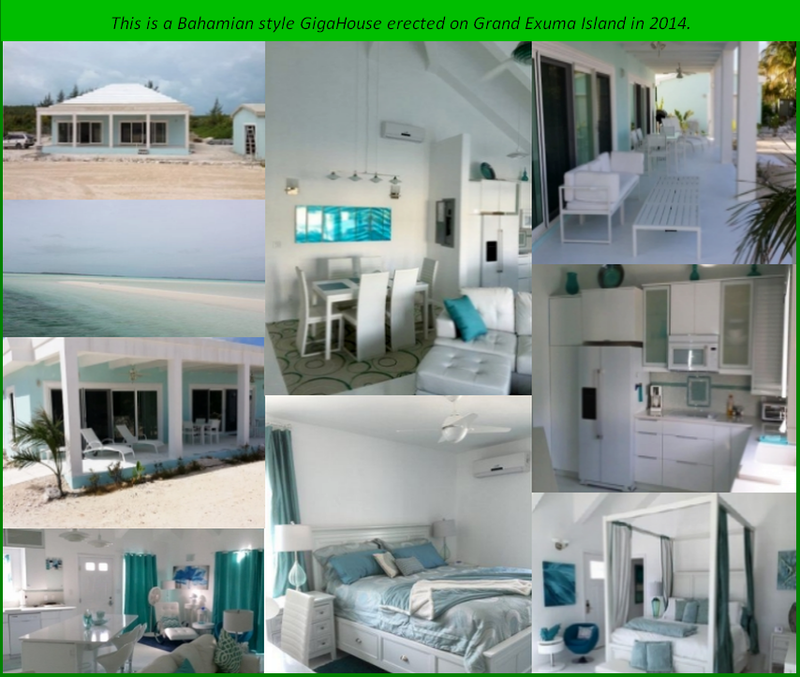 This is the GigaHouse on Great Exuma Isle, Bahamas. The owners rent it to vacationers at a cost of $400-450 per night. They all love it. It's exceptionally QUIET as well as comfortably cooled by only one aircon unit, not the two or three the owners had figured upon. The house and rooms within are virtually soundproof. Outside noise from passing traffic or construction noise is practically eliminated. Electricity is expensive there, and we all know how frugal renting vacationeers are with electricity when it's included in the deal. Owners are therefore saving themselves big bucks not to mention that their house, because of outstanding qualities inherent in the construction, has developed a favorable cachet, and word is spreading fast. Zero to low maintenance, to boot. Something for financiers and builders of vacation homes and resorts here to think about. Further, Hurricane Joaquin pounded the dwelling for 2.5 days with 130-150mph winds. No damage whatever. Safe and comfortable inside, too. Owners paid 15% above because everything had to be imported, shipped F.O.B. Las Vegas. With a USVI GC factory in play, costs will drop quite substantially. GCC estimates cost at 30-50% cheaper than concrete and build time 40% faster than concrete. Alas, concrete is yesterday's technology in these applications. With a job-creating, export-enhancing factory in operation, the market will settle the issue of which technology is better value, better quality, better strength, and better weatherproofing for the money. In any case, as V. Hugo wrote, "Nothing can stop an idea whose time has come." Everything has to be "imported, shipped F.O.B. Las Vegas" for the Virgin Islands right now too. So, it will still be more expensive than concrete here too. The promise of a GigaFactory is wonderful, of course, but come back on the board and tell us all when it's actually in place and the product is finally competitive with concrete. Until that point, paying more to be a guinea pig, especially when the price drop is just around the corner, seems like a dumb idea. Why not visit the GigaHouse for yourself before passing judgment? It's at the intersection of the Humane Society Road and Market Square East in St. Thomas. Check it out. Talk to project manager Phil. Keep in mind that materials for the Exuma GigaHouse were shipped to the Bahamas which, unlike USVI, is not US soil. There are Bahamian duties and taxes to consider. The Bahamas recently amended their duty schedule in light of a newly imposed VAT tax. Therefore, using the 15% premium argument for USVI is inapplicable. USVI imports most of their stuff, too. As said, talk to Phil at GCC GigaHouse HQ, and get the skinny. Who knows? It might lead to new opportunities not now on the radar. Shipping MIA to the Bahamas is much cheaper than JAX - STT/STX though. Oh, another guinea pig now using the GC quick-build system. lol This time it's Fortune 500 Davita Healthcare, $12 billion annual revenue and 58,000 employees, for their new dialysis centers. A bit of history being made as work on USVI's first GigaHouse, not understatedly a revolution in housing, nears the finish line. The exterior is done and plastering with the unique interior coating proceeds apace. See image. Years hence, they may say in USVI, this is where it began. In hopes of a stronger and more resilient USVI to rise from the current calamity. After all, the human spirit is indomitable. Following Hurricane Irma, Phillip Smith, Project Manager of GigaCrete Caribbean (GCC), posted a short FB video (q.v.) reporting the storm's minimal impact on a GigaCrete "GigaHouse." This particular building on STT serves as GCC office & model unit. It was erected in 2016 on a parcel across from Cost U Less on Weymouth Rhymer Hwy. There is another completed GigaHouse (privately owned) at Frenchman's Bay. Neither house suffered structural or significant damage. A third GigaHouse, a 2-storey structure, is under construction in Hull Bay area, and a fourth, in kit form, has lately been delivered to GCC HQ. A fast-build GigaCrete GigaHouse is an immensely strong, hurricane-resistant house featuring next-generation if not revolutionary 'green' materials. It will have to be a lot cheaper than concrete to draw widespread interest. For the skinny, call Project Manager Phil Smith 1-340-690-3316. Only to add there's value added by energy efficiency; low maintenance; resistance to earthquakes/hurricanes; no drywall or wood; no mold, mildew, insect or efflorescence issues; and peace of mind when Mother Nature strikes. GigaHouse R28-60 insulation cuts overall electricity consumption dramatically. Phil would be the man to talk to. Maybe I'm wrong here, but aren't the Force 10 homes on St Croix put up by Ken Mashburn Construction several years ago, the same thing? These Force 10 homes came unassembled in a Sea container from Australia, had all the materials needed - Mashburn's crew assembled them on site to create a hurricane proof home. The Force 10 and GigaCrete building systems are different animals in respect to materials, methods and complexity.. Videos linked below depict the GigaCrete bulding system.. Video 1 shows step-by-step construction of the GigaCrete Caribbean office/demo near Humane Society. Video 2 examines how the steel-frame / EPS shell is set up. As Forbes magazine put it, the "secret sauce" are the coatings. GigaCrete's incredibly strong proprietary coatings bonding naturally to EPS panels encapsulating the patented steel stud frame help explain why GigaCrete homes endure cat 5 hurricane winds and gusts without much bother.